The Apostolic Succession is the means by which sacramental validity is assured in all Catholic churches: it means that a valid bishop is one who is consecrated by the laying on of hands in an unbroken tactile line that stretches back to the twelve Apostles and to Jesus Christ Himself. The Apostolic Succession is as important spiritually as it is historically. For the Old Catholic Church International, these original records reside with the historic Churches of the East and with the Roman Catholic Church, since our descent from those churches occurs as recently as the twentieth-century. For this reason, it is necessary only to show the latter stages of this descent, the earlier stages being well-documented in standard references elsewhere. The value of the union of the different strands of the Apostolic Succession as they have been transmitted to various churches is considerable in ecumenical terms, since it transcends differences in theology and belief, and acts to unite the Church as the Body of Christ. As will be seen, the principal orders present in the Church today derive from Orthodox missions planted in the UK and USA during the nineteenth and twentieth-centuries. They do not originate in schism, and the agreements of intercommunion referred to above indicate that their validity is accepted by a number of mainstream denominations. This widespread recognition is unique to the Apostolic Episcopal Church among independent Catholic churches today. However, although it is welcomed as a bridge towards ecumenism, it should be understood in that context only. The Apostolic Episcopal Church and the Old Catholic Church International are autonomous, independent churches, and do not depend on any other church for their internal definitions of sacramental validity. 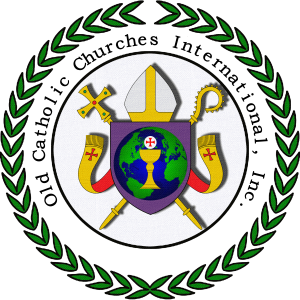 The present-day Old Catholic Church International has successions from many other historic and modern churches. Below you will find the records of our Apostolic Succession.